We can now provide your promotional products. Products include USB drives, mouse mats, bottle openers, drinkware, lanyards, clothing, pens etc. We are now able to provide all your web hosting needs, email hosting, Fax to email services and email marketing. If you want to improve your online presence, please contact us for details, or check out our web pages. QR codes are a 2 dimensional barcode primarily read by smart phones with the appropriate scanning software or app. These barcodes can store all sorts of useful information, from contact details that can be added to a users address book, url's to take the user to a web page, a calendar event for their calendar, an email address or just plain text..... the possibilities are endless, only limited by one's imagination. One important point to remember, when directing a user to a web page, you should have that webpage optimised for mobile devices, after all, there is an extremely high chance they will be using one. You don't want to spoil their user experience. Engage the user, have a call to action, and make the most of them, but don't use them just because everyone else is. Think outside the square. Bleed is a printing term that refers to printing that goes beyond the edge of the document to be trimmed. When any image or element on a page touches the edge of the page, extending it beyond the trim edge, it is said to bleed. It may bleed or extend off one or more sides. Photos, rules, clip art, and decorative text elements can bleed off the page. The bleed is the part on the edge of a document that gives the printer a small amount of space to account for movement of the paper throughout the printing and cropping process. Bleed ensures that no unprinted edges occur in the final trimmed document. Particularly when long-run prints are made, the paper may move around. Without adding a bleed to your document, a document may become slightly misaligned in the cropping process and result in white unprinted edges. Not a good look. Bleeds are generally 3-5mm from where the cut is to be made. This can vary from print company to print company. A 5mm bleed is the safest option for printing, especially in large quantities. Failing to provide bleed can result in finished pieces showing a thin area of white on the edge. 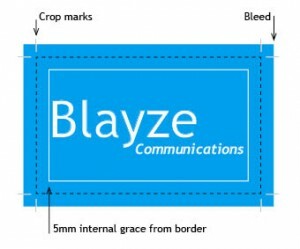 Similar to the way bleed eliminates the chances of misaligned white space appearing on a printed document, making sure you give text and images about 5mm grace from the interior border of a document, will help protect your document from losing any vital elements to the cropping blade. See diagram below for reference. The dotted line represents where the document will be cut. The white line is the internal grace line where all vital text and images should remain within. If you have any questions, please don't hesitate to send me an email. One of my things in life is managing productivity. A big part of this is time management. To assist with this I have become a big list maker, both at home and at work. Up until recently, I have kept my to do lists manually, writing a new list at the start of each week. When I bought my iPhone, I discovered a new software app (application) called Things. I have it both on my iPhone and my iMac. It saves having to rewrite ongoing tasks each week. Things is simple to use and it is synched between my iPhone and desktop using my local WiFi network, so I have an up-to-date list where ever I am.